Our chapter meetings are open to anyone looking to learn more about the organizing industry. You can pay online prior to the event or you can pay via check or cash at the door. 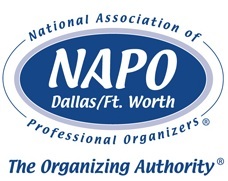 All Industry Member, Employees of Industry Members, Corporate Associate Members and CAM Representatives of NAPO DFW. This informative event is a member favorite, and our entire night is devoted to answering all of your burning questions about the Organizing Profession. Our three veteran organizers possess over 20 years of organizing experience! We will also be holding THREE drawings! 1) Considering Membership? A 6-month membership will be given to non-member!! 2) Also, one NAPO-DFW member will be reimbursed the special event meeting fee for the evening!